Mish's Global Economic Trend Analysis: Pact With the Devil? Syriza Projection 150 Seats; Coalition Deal Already; "Indisputable Mandate to Leave Austerity"
Pact With the Devil? Syriza Projection 150 Seats; Coalition Deal Already; "Indisputable Mandate to Leave Austerity"
With vote counting nearly over, it appears Syriza captured exactly half of the 300 member Greek parliament with approximately 36.3% of the vote compared to 27.8% for New Democracy. 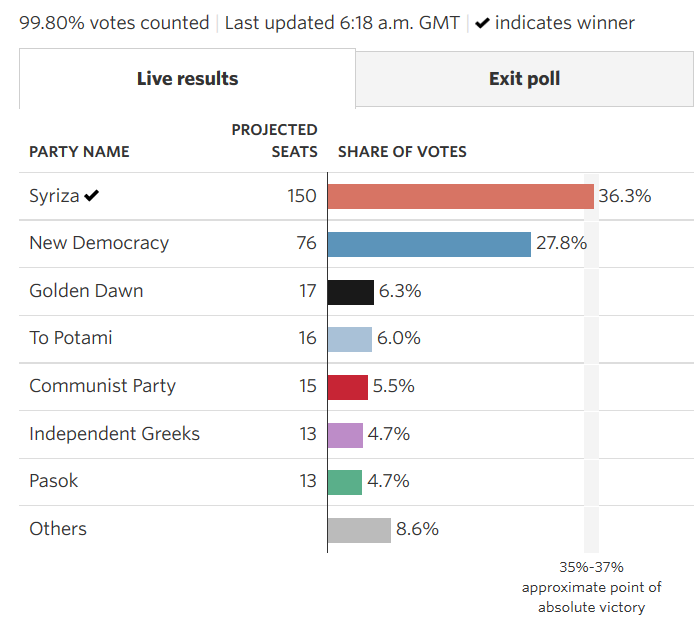 Syriza is one vote short of an outright majority. However, Syriza has already secured an alliance with the Independent Greeks, a right-wing party that shares little common ground with Syriza except for its rejection of austerity measures. The coalition would have at least 162 seats, and that's an allegedly comfortable governing majority. I do not rule out other alliances. But holding them all may prove difficult. Certainly this was not the alliance most expected. Can Syriza govern with the Independent Greeks on some issues and another party on others? Or will this all blow up soon? If the latter, before or after Grexit? For now, it's party time for Syriza, albeit one vote short of an even bigger party. Of course, there is always the chance of a party shift. It only takes one shift. With that backdrop, please consider Greek Vote Sets Up New Europe Clash. A Syriza victory marks an astonishing upset of Europe’s political order, which decades ago settled into an orthodox centrism while many in Syriza describe themselves as Marxists. It emboldens the challenges of other radical parties, from the right-wing National Front in France to the newly formed left-wing Podemos party in Spain, and it sets Greece on a collision course with Germany and its other eurozone rescuers. Tsipras will have a mammoth task at home and abroad. For one thing, Syriza is a broad coalition of the left that includes factions that believe Greece should leave the eurozone. Those factions would pressure Mr. Tsipras if he moves to compromise with Europe. The pressure to compromise will be intense. Under the bailout program’s rigorous schedule, Greece is required to complete a review of its progress with the so-called troika of bailout inspectors by the end of February. Mr. Tsipras has said he doesn’t recognize the troika’s authority. The Wall Street Journal called the coalition of 162 seats a "comfortable majority". I called it an "allegedly comfortable majority". Time will tell which version is correct. But other alliances are possible as well. It's interesting this coalition is the one that emerged rather than a coalition with one of the other leftist or centrist parties. Perhaps there is more in common on the issues than is apparent at first glance. Then again, perhaps so many are so fed up with austerity they would sign a pact with the devil to get rid of it. The above sounds like a hard bargaining chip, and it is. But Tsipras would have to give up everything he has stood for to accept that stance. Also, his coalition would collapse and he would immediately be out of office. When do politicians voluntarily accept that fate? Tsipras may easily decide he has nothing to lose. Moreover, Tsipras has his own nuclear bargaining chip. If Greece exits the eurozone, the rest of the countries immediately become liable for Greek debt. On January 22, with thanks to Dr. Eric Dor, director of IESEG School of Management in Lille, I posted a Revised Greek Default Scenario that showed "Liabilities Shifted to German and French Taxpayers". Who is bluffing whom with Italian liabilities at 48 billion euros and Spanish liabilities at nearly 33 billion euros. See link for other countries' liabilities. The Syriza position is clear: They were given mandate to “ignore austerity”. IMF and ECB stance is also clear: There are room for talks on maturity and terms but no on substance and doubts about repayment. The EU, being the political animal it is, will look for compromises and short cuts, but end of the day this process is running out of time there are no new “pockets” to move the problem to anymore. Greece needs a haircut. Anyone can see that. Getting it and executing it is probably the biggest single challenge. Unlike what we are trained to believe often there are no solutions to a lot of the problems we face. That’s the real conclusion on last night election result. Actually, there is a short-term, can-kicking solution of sorts, but that would require some compromises on both sides. Longer term, even if some writedown of debt was worked out, all of the eurozone structural problems still remain. Finally, it's one thing for two or three parties to work out a compromise. It's another thing indeed for 18 parties all to agree, especially when some of them perceive they have to contribute more than everyone else.